Financial decisions can be complex and abstract beyond the cognitive capacities of individuals. We trust accountants not only to represent decisions in financial terms, therefore, but also to simplify them. Simplification, however, embodies some decisions in advance of making further decisions possible; it facilitates the recognition of some options and perspectives at the expense of others. Simplification is not always oversimplification, and it can be a mistake to criticize it as such. Yet although there is a pragmatic need for the simplification accounting offers, as that simplification becomes more extensive the decisions accountants make in achieving it becomes more consequential. 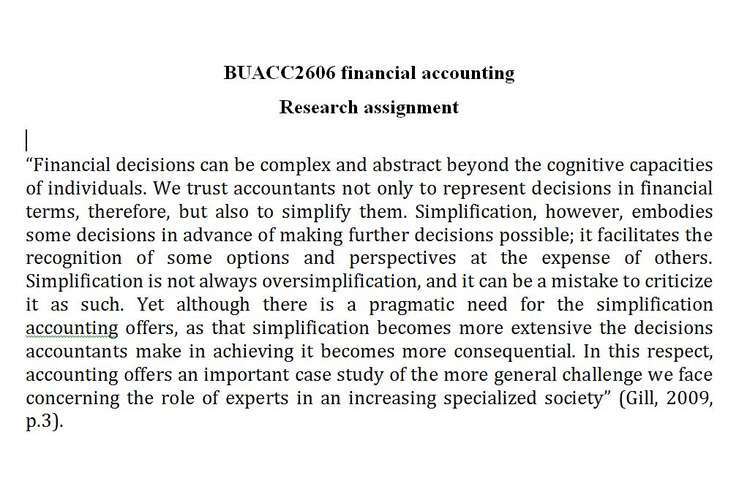 In this respect, accounting offers an important case study of the more general challenge we face concerning the role of experts in an increasing specialized society (Gill, 2009, p.3). Gill, M. (2009). Accountants’ Truth.Knowledge and ethics in the financial world.Oxford University Press. Oxford. Download a 2015 annual reportfor a listed company (in the top one hundred)on the Australian Securities Exchange (ASX) website. Groups are not allowed to do the same company and should discuss their selection with their tutor prior to commencing their research assignment (Banks are not allowed as they have particular reporting requirements). With reference to the above statement describe what you understand by the accounting methods mentioned and provide examples from your selected annual report. In your assignment use a 12-pt Times New Roman font, use 2 cm margins on all four sides of your page and 1.5 line spacing. Evidence of extensive research beyond the prescribed text is required. Ensure these are referenced appropriately. Refer to the statement regarding plagiarism. This assignment must be handed in for successful completion of the course and will count 25 marks towards the final mark. The assignment is to be conducted in groups of two. Students do not have the option to extend or reduce the size of the group.The lecturer, in the evaluation of the group submission and each individual’s contribution, may require any or all of the members of the group to discuss various aspects of the assignment. All assignments are to be uploaded to Moodle. Should you need assistance, please use the available resources and support through the drop-down menus in Moodle or speak to your lecturer/tutor.